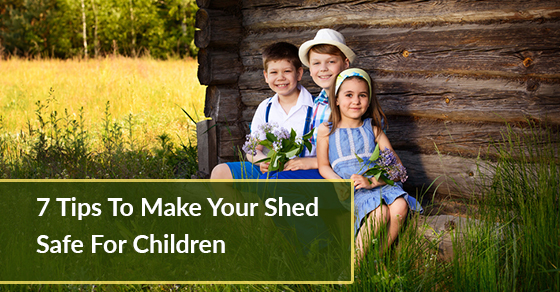 Is Your Shed Child Friendly? Would you dare crawl in and around your shed without protective gear? While you understand the dangers of exposing your skin to injury, toxins, and sharp objects in your shed, your children may not necessarily be aware of these threats. They’re naturally curious and will try to access everything, including things placed in locked or hard-to-reach areas. It is unfortunate that unintentional injuries are the leading cause of death of children under 14 years. More than half of these injuries happen at home. So parents have an obligation to keep their home safe without placing so many restrictions that your children have no way of enjoying themselves. Storing sharp tools and equipment securely in locked toolboxes. If you introduce your child to basic gardening, you should ensure that they protect themselves, use safe tools, and don’t handle any chemicals or fertilisers without supervision. Teach your children how to handle the essential tools safely, and instruct them to always ask your permission before even touching them. Use corners and edge bumpers to secure the edges of sharp objects including counters, cabinets, and tool sheds. Avoid choking hazards with small play items such as craft supplies by storing them in childproof containers and keeping them on higher shelves. Install door holders and/or doorstops to prevent the children from getting their fingers crushed between the door and the frame. Use quality items that won’t break into pieces and increase the risk of choking or tripping. Place childproof outlet plates and covers over all electrical plugs. Make sure that they fit properly so the children can’t pull them out, and are big enough so children can’t chew or swallow them. Provide openings to let in adequate light so all areas are clearly visible. This will help reduce the risk of accidents due to poor visibility of spills and other hazards. Consider using safety glass in all glass surfaces, or adding a small trellis over the glass to reduce the impact from flying objects. Your children should be able to play around freely in the backyard without fear of breaking anything or injuring themselves on broken glass. No matter how disciplined your children may be, you should be proactive about ensuring their safety. Don’t apply pesticides in their presence, avoid operating electrical equipment when the children are playing nearby, and quickly clean up any spills – water, oil, fuel – to avoid accidents.